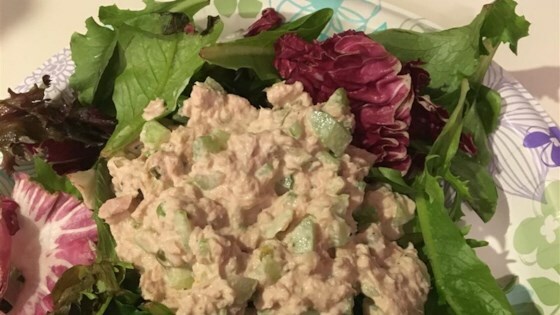 In a mixing bowl, combine the tuna, lemon juice, mayonnaise, celery and pickle relish. Mix together well and refrigerate until ready to serve. The original can of tuna was 6 ounces and has since been reduced to 5 ounces due to manufacturer's change. Amounts of mayonnaise may need to be slightly reduced. Very easy, but I wonder if 2 Cups of mayo is a typo??? How about 1/2 C?? Has a good flavor but I made it with the recommended 2 cups of mayo, and it was WAY too much...so I made it over again using only 1/2 cup of mayo...better. add an egg per can and mmmmmm perfect! Exactly the recipe I have been looking for all my life!! I followed others' advise and cut the mayo in half. Still too much. Too much relish, and not any zing like celery seed or garlic salt may have provided. Wouldn't make it again. Way TOO MUCH mayonnaise. I cut it by 1/4; I should have used only half.